Front shock tower for the Xray XB4. 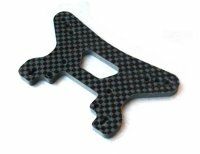 Made from 4mm carbon fibre, this shock tower has also been redesigned to add more material above the shock mounting holes. Made from high strength 4mm carbon fibre.